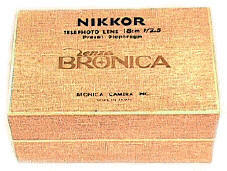 Bronica was introduced in 1959 with Nikkor lenses made by Nikon. 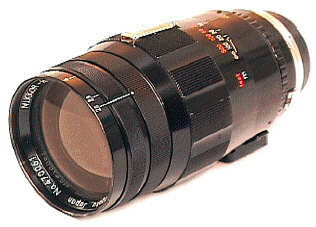 The longer 180 to 500 lenses were modifications of existing Nikon Rangefinder lenses, only made in Bronica mount. Strangely enough, the big Nikkors covered 2 1/4. While the 180/2.5 Nikon Rangefinder mount is rare, the Bronica 180/2.5 is even harder to find. Notice that chrome thing on the barrel ? Believe it or not, that is the focusing lever! This is a pre-set lens, which means the photog pre-set the selected aperture, then manually (or womanly) turned opened or closed the aperture to the pre-selected opening. Compared to today's plastic wonders, the machining on this lens is close to unbelievable. Damn, what we had to put up with before camera manufacturers discovered everything was "better" with plastic. Your eyes are not deceiving you. The tripod socket was a special machined bayonet mount. With original caps, and red velvet lined box. Measuring 7 3/4" inches long with a 82mm filter size, the 180/2.5 weighs in at a not too petite 4 3/4 pounds. An expensive lens intended for professional use, most 180/2.5 Nikkors (of any mount) show scars just from jostling around in the camera bag from their own weight. According to a Japanese friend who researched it with Nikon, only about 180 of these were produced in Bronica mount ! !